I recorded a version of this essay while riding a bike to and from yoga in a village two hours outside Kochi. A few days later, I arrived at a residency retreat in the mountains of Vagamon, where the owner encouraged me to use the space as a canvas. The decision to paint this meant ceding control of my intended meaning of words, space, color. In this process of sharing, something is always (or often) lost, and hopefully gained. About four lines in, I recorded a memo asking: "Painting or writing?" 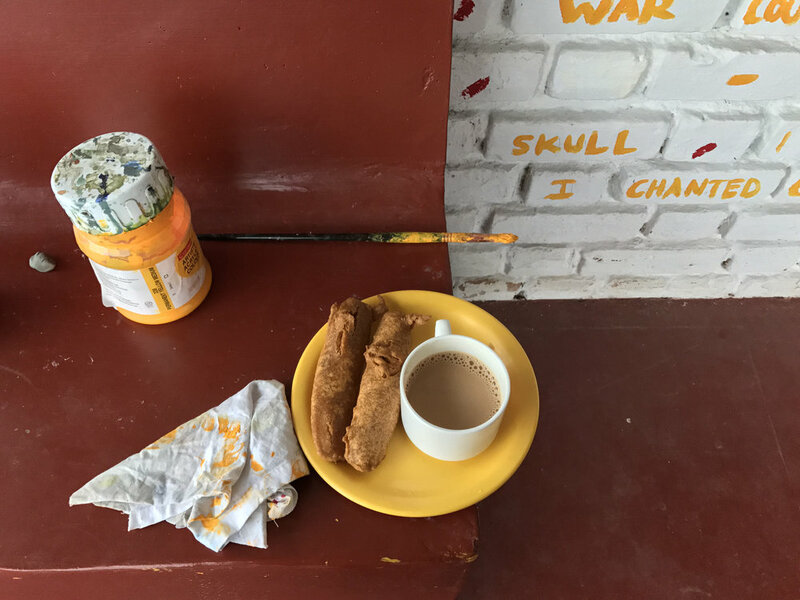 This was largely inspired by several pieces at the Kochi-Muziris Biennale. Technically, the process took about 12 hours, including writing; however, it's more accurate to say that each aspect is a sort of culmination of this journey. Many thanks to Palette People for making this possible & Massolit Books in Kraków, Poland for the invitation to give a talk titled Biennale Immersion: Experiencing Art in India. Sister I. nodded at me as I walked into her yoga class late. for an elephant that zoomed by in the opposite direction. Seventeen faces stared at me. This is not on the script. The ride home was hot, hotter, denser were the honks, the yelling, the stares. Open or closed. Open or closed. Closed, a "them" statement; open, a question, a sort of mirror. My way is one way. A place where "Why do these people do this?" is "Why do I do that?" I wave back at young boys wearing white kufi. I wonder how locals in my homeland would greet them. to, it's a choice you make every moment. It is as simple as a glance. If ... knew what this felt like, war could not exist. traveler, not someone who travels, unrelated to tourism. I chanted om shanti shanti shanti with my yoga teacher, in her habit. Even beside a heap of burning trash, it's a breath of fresh air.